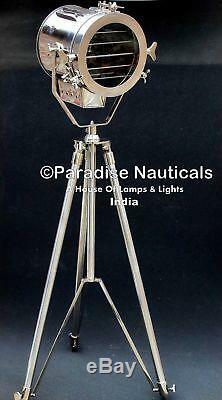 Vintage Film Movie Light Antique Art Deco Silver Nautical Floor Lamp Mid Century. Steel & Aluminum Tripod Finish. E27 or E27 (Standard Screw). FRONT DIAMETER : 21 cm approx. EAR TO EAR : 25 cm. FRONT TO BACK : 27 cm approx. TOTAL HEIGHT : 177 cm approx. BULB WILL NOT SEND WITH ANY LAMP FOR SAFETY REASONS. 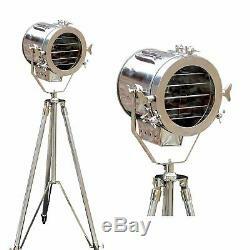 The item "Vintage Film Movie Light Antique Art Deco Silver Nautical Floor Lamp Mid Century" is in sale since Tuesday, October 31, 2017. This item is in the category "Antiques\Periods/Styles\Art Deco". The seller is "lampsandlightings" and is located in ROORKEE, UTTARAKHAND. This item can be shipped worldwide.